Chaman: Muhammad Amin holds the hand of his baby girl to the polio worker (vaccinator) at the border crossing. They are at the Bab-e-Dosti, or the Friendship Gate, crossing over from Afghanistan into Chaman. The thumb of one year old Farida is marked blue – a sign that she has been vaccinated for polio. 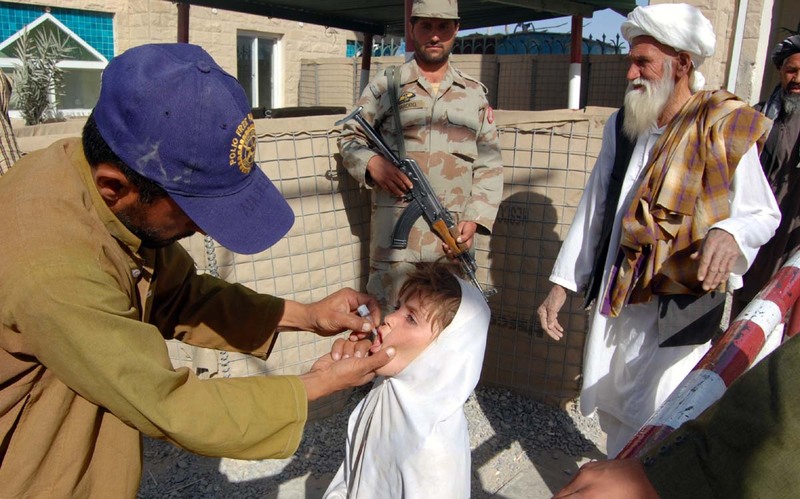 “She has been given the polio drops there,” he tells the polio-worker here, pointing to the polio booth on the Afghanistan side of the border. Amin has just arrived from Balk in Afghanistan. At the Pakistan-Afghanistan Friendship Gate, where the wind whips up dust particles, turning everything a shade of grey, rickshaws and pick-ups wait to take those arriving from Afghanistan into the Chaman city and beyond. The vehicles stop three kilometers short of the gate. People coming from or going to Afghanistan have to walk to the gate where they stand in a queue between a narrow passageway with iron mesh fence on both side. They stand there with their children and belongings, waiting for their turn to be cleared for crossing. There are two different passageways for people leaving and arriving. At the gate, where they cross the border are two polio-workers. Two of the polio workers with torn blue “Rotary International” caps on their heads stand in the main entrance of the gate. One of the border security guard shouts at Wali Muhammad, a polio-worker at the entry point to get out of the way. “Can’t you see it’s getting crowded here,” he says, asking Wali to clear people quickly so they can cross over to the other side. Wali keep running after men and women, quickly checking their children’s fingers and foreheads for the vaccination marks made in Afghanistan. The room allocated to the polio-team for vaccination has a lock on the door. The polio-volunteers work in the open air where it is all chaotic due to the crowd and security, getting in the way of proper vaccination on the Pakistan side of Pak-Afghan border. The Afghan side of the border has advertisement charts and sheets hanging from every wall. There are 48 volunteers busy vaccinating children. The polio vaccination staff wear caps, wear badges on their chests. They have permanent rooms and shelter over the vaccination team. Pakistan figures high among countries from which polio virus can be transmitted internationally, especially to Afghanistan and the Middle East as it happened last year, Leilia Dore, Communications Officer, Global Polio Eradication Initiative, World Health Organization, Geneva, told News Lens via email.